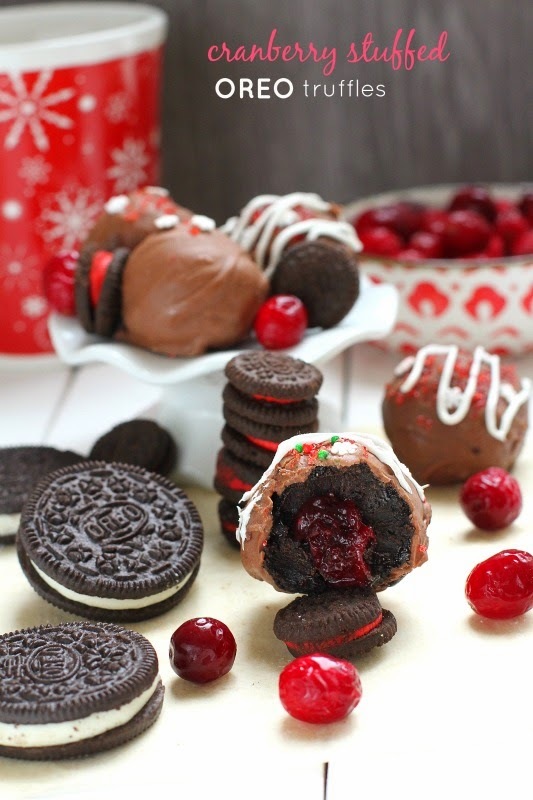 Truffles made with Oreo cookies and stuffed with homemade cranberry sauce. 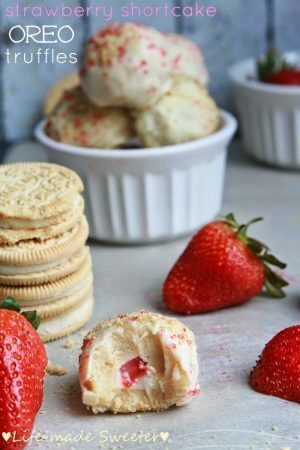 An easy, festive and elegant no-bake treat! If your kitchen is anything like mine these days, chances are it’s covered with tons of sugar, flour and chocolate. So today, I wanted to share an easy gift idea recipe for you that won’t take up too much of your cookie making time. I adore truffles especially during the holidays and since the last time I made them was in the summer, I thought it would be appropriate to make a more festive version to have around for the holidays. 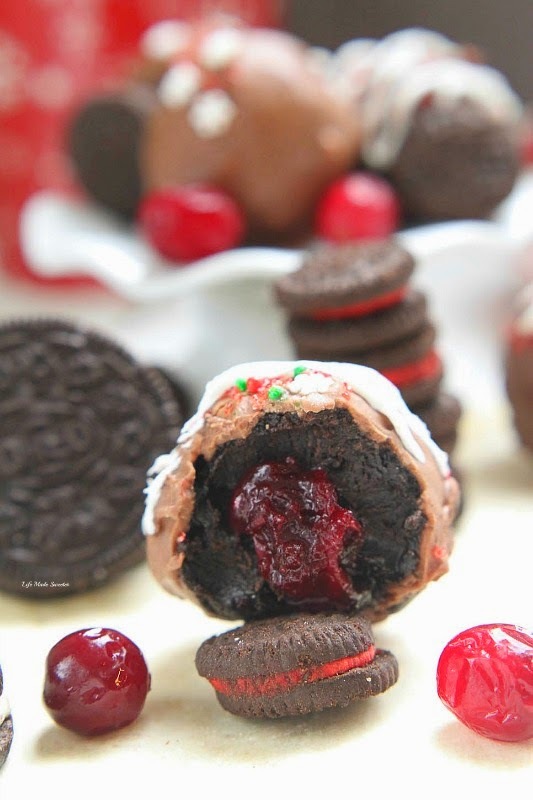 These Cranberry Stuffed Oreo Truffles are even easier than traditional truffles since you won’t have to heat up any cream. Just toss in some Oreo cookies with cream cheese into your food processor and you’re ready to start rolling. For this version, we stuff the middle with some homemade cranberry sauce for a fun holiday surprise. These are perfect for using up any leftover cranberry sauce you might have lying around. All that’s left is dipping them into some melted semi-sweet chocolate and then tossing some sprinkles on to make them festive and pretty! 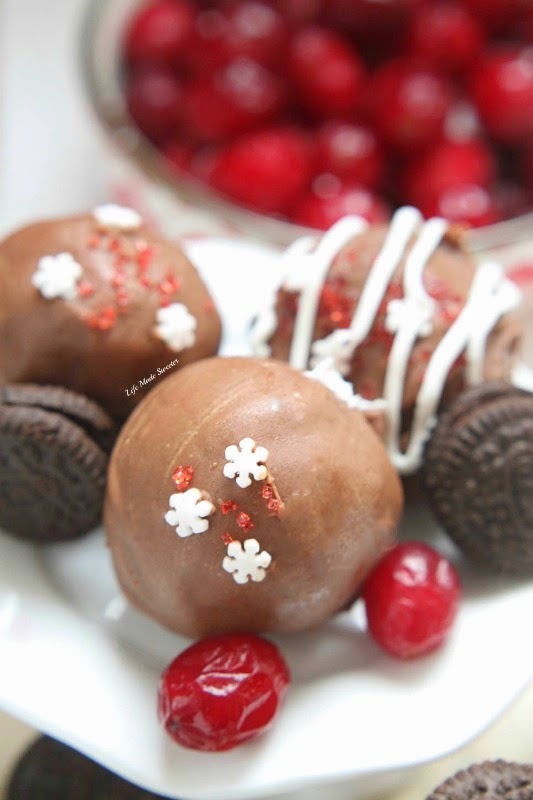 An elegant holiday treat that’s simple to make! Using a measuring spoon, scoop out 1/2 tablespoon of oreo mixture. Roll into a ball and flatten. 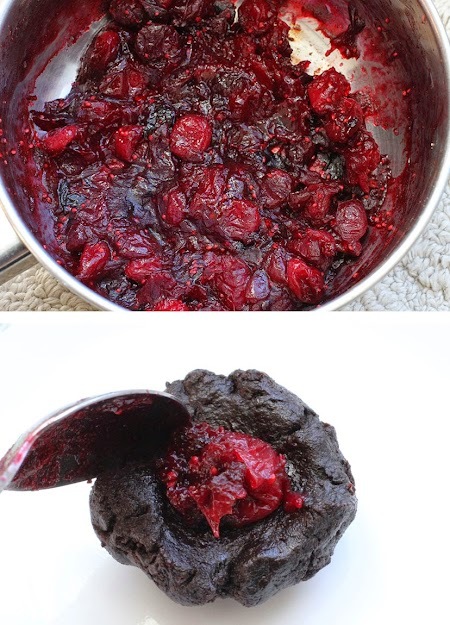 Add a tiny amount about 1/8 - 1/4 teaspoon of cranberry sauce in the middle. 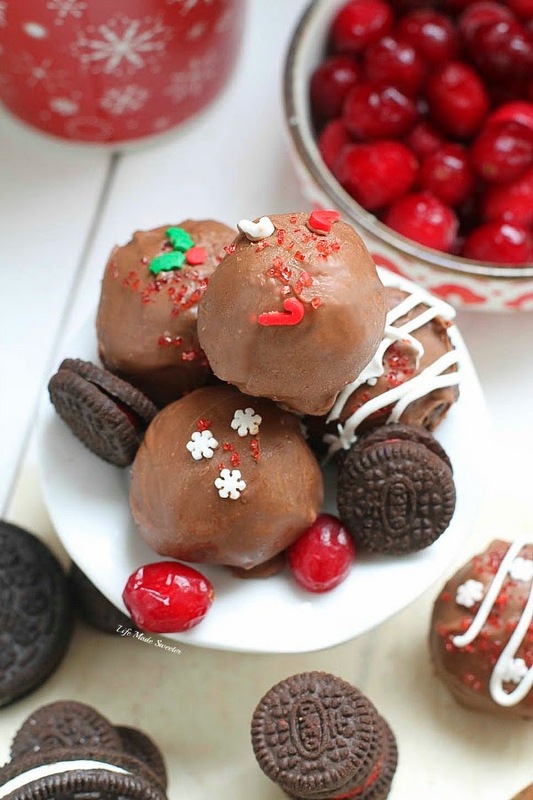 Scoop another 1/2 tablespoon of Oreo mixture on top and roll into balls. Place balls on a plate lined with parchment paper. Freeze the truffles for about 30 minutes. Place chocolate chips in a deep (enough to dip a truffle) rubber Tupperware and place over a double boiler on low- medium heat. Stir chips until they are just melted and thin enough to coat the truffles. Add 1-2 teaspoons of vegetable oil if you need to thin out the chocolate some more for easier dipping. Be careful not to burn or overheat the chips. Remove 1 truffle from the freezer at a time. Pick up truffle with a fork and dip in melted chocolate, gently tapping your hand holding the fork to remove excess chocolate. If chocolate hardens up while dipping, replace the Tupperware back over the double boiler on low heat just until the chocolate melts again. Place truffle on a lined baking sheet - use a toothpick to help remove truffle from fork if needed. Top with sprinkles while the chocolate is still wet. Decorate with some melted white chocolate or icing if desired. 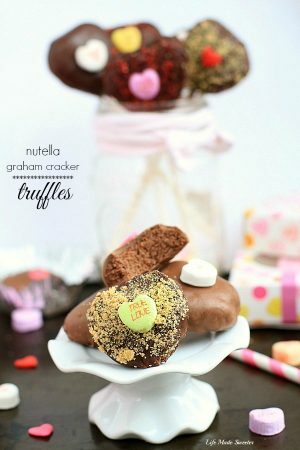 Refrigerate truffles for at least 10 minutes so the chocolate sets.